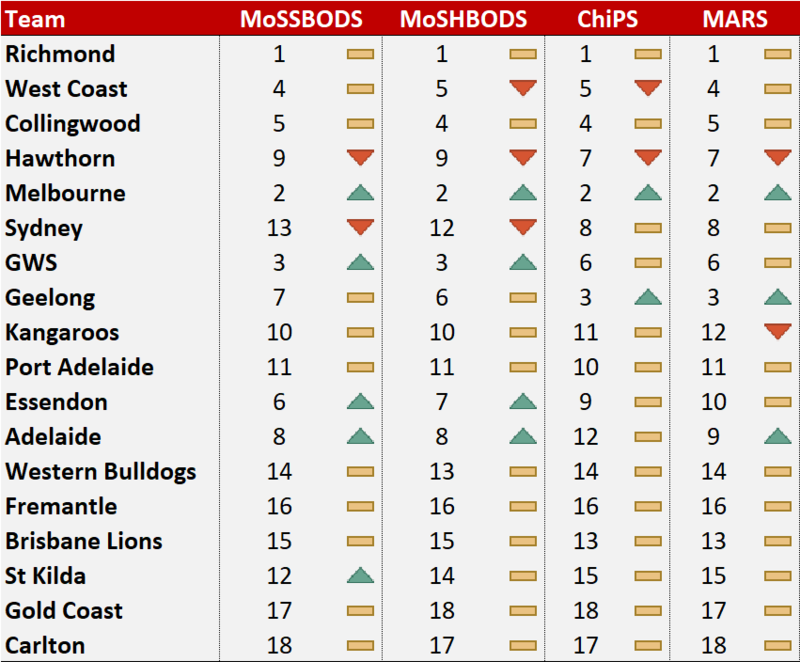 Richmond preserved their narrow leads on both the MoSSBODS and MoSHBODS Team Rating Systems, remaining just 0.3 Scoring Shots ahead of Melbourne on MoSSBODS, and dropping 0.2 points on MoSHBODS where their lead is now only 1.5 Points. That left the two Systems with the same Top 3 of Richmond, Melbourne and GWS, and agreeing, in total, about the ranking of nine teams, while differing in the ranking of only St Kilda by more than a single place. MoSSBODS has them 12th and MoSHBODS 14th. On offence, Melbourne is now rated 1 Scoring Shot better than Richmond by MoSSBODS, and 4.4 points better than Richmond by MoSHBODS. On defence, Richmond is rated 1.3 Scoring Shots better than Melbourne by MoSSBODS, and 3.8 points better than West Coast by MoSHBODS. Across all 18 teams, we now have Melbourne ranked 2th by MoSSBODS on defence, and 6th by MoSHBODS, with no other team ranked more than two places differently on either offence or defence by the two Systems. ChiPS re-ranked just four teams this week, moving West Coast and GWS into 5th and 6th, and dropping Hawthorn and Sydney into 7th and 8th. MARS moved only three teams, leap-frogging GWS into 6th and dropping Hawthorn and Sydney one place each to accommodate the move. Both Systems still agree that the Top 3 teams are Richmond, Melbourne, and Geelong. More broadly, the two Systems agree about the ranking of 10 teams, and differ by more than two places only in their ranking of Adelaide, which ChiPS ranks 12th and MARS 9th.